Pinterest pins of beautiful Balboa Park! – Cool San Diego Sights! 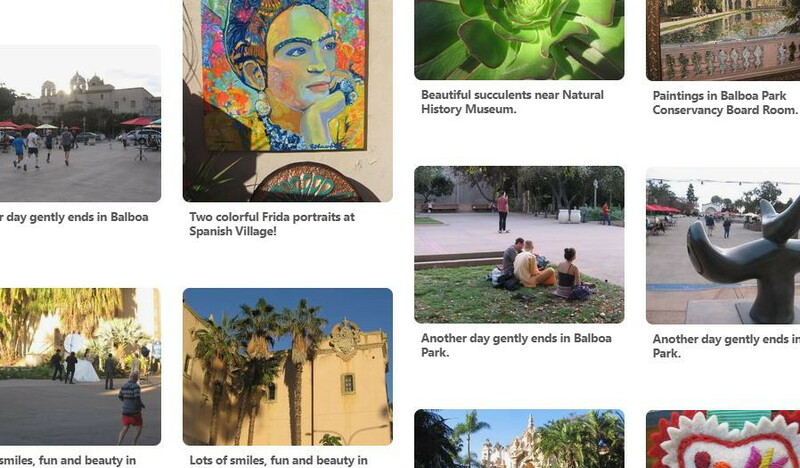 Pinterest pins of beautiful Balboa Park! Do you love Balboa Park? I just added a bunch of colorful photos to my page of Pinterest pins concerning Balboa Park. You can see them here. These represent some of my best photographs from my special blog Beautiful Balboa Park. You might also visit some of my other San Diego Pinterest boards, which I update from time to time. I have pins of places and events, San Diego Comic-Con and street art, and all sorts of cool, surprising stuff! Feel free to pin or repin anything you’d like! I love the way Pinterest organizes so many memories all together in one place. If I’m stuck indoors and miss walking, a jumble of wonderful visions is just a click away! Previous Previous post: Fun art on the sidewalk for a rainy day. Next Next post: Photos of 2018 Cherry Blossom Festival!